This week I hosted a Bunny Bunco Event. It was so much fun!!! 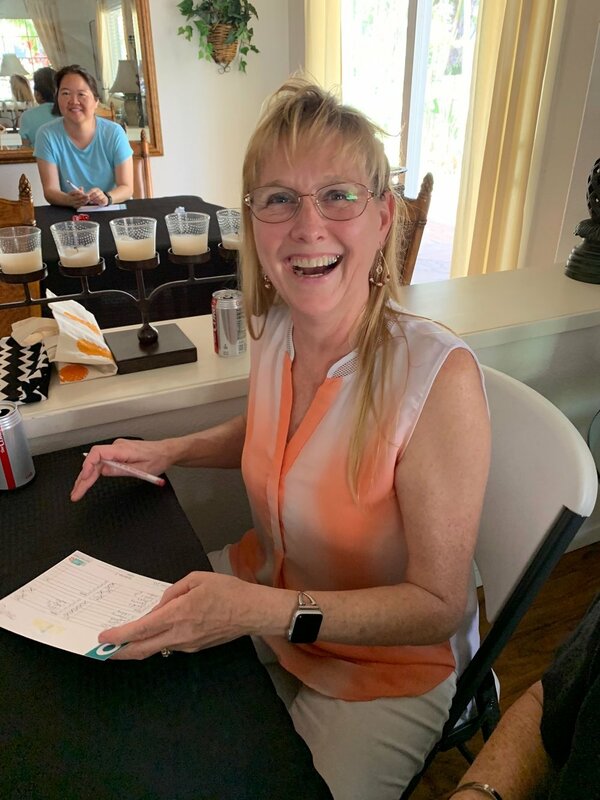 I love all the love and laughter that fills my home when everyone comes over to play bunco and see some of my favorite Stampin’ Up! products. This month I featured our cute Mini Pizza Boxes. I showed how you can use them to quickly create some punch art bunny boxes for your Easter treats. Would you like to know how to create this box? The first thing you need to do is create the ears. Take 2 pieces of Thick Whisper White Card Stock and cut them at 1 1/2 x 5 1/2. Use the Detailed Trio Punch to round the top two corners. On the bottom of the ear, use a scoring tool to score at 1”. Put some adhesive below the one inch score line and glue the ears to the inside of the Mini Pizza Box. The inside of the ears measure 1 1/4 x 4 1/4. Round the top two corners and attach them to the Whisper White ears. For the whiskers, I took a 5 1/2 inch piece of Basic Gray card stock and cut tiny strips with a paper cutter. I then attached them to the middle of the box with a couple of Mini Glue Dots. The nose was made with a 3/4 inch circle punch and the eyes were made with the 1/2 inch circle punch. I used one of my favorite retired bow punches for the bow but you could certainly use an actual ribbon of any color, if you don’t have this punch. I used the Pretty Label punch to create a tail for the back of the box. I stamped it with a sentiment from the adorable Fable Friends stamp set. Fill these with paper shreds and the candy of your choice. They make great favors and look super cute with their long ears and whiskers. It was fun making these bunnies and I loved the expressions of all my guests when they saw them on display. Speaking of expressions, I love Renee’s expression below. Bunny Bunco was a blast as you can see!!! I love it when my house is filled with so much love and aloha! I got lots of positive comments from this group about these favors and hope you will enjoy them as much as they did. They are quick to make and sure to brighten the day of whomever you create them for. My friend Shelly Matautia is a wonderful Mom. I love how her face lights up when she talks about her children. She is one proud Mama and she should be. She’s has two amazing kids and has had the privilege of watching both of them compete as college athletes in volleyball. Her son Austin is currently a Junior at UCLA and is an outside hitter on their men’s volleyball team. Shelly would love to be at every game but since there is an ocean separating them, it makes it difficult and expensive to be there. Shelly certainly does her best to watch him in person as often as possible. I have had the privilege of watching Austin play before and it is quite exciting. It is wonderful to see athletes so passionate about their sport. Austin is an incredible athlete and volleyball player! A couple weeks ago, Austin was playing in a volleyball match when he got badly injured. Unfortunately, Shelly was not at that game but she was watching online. I can imagine how her heart must have felt to see her son get hurt and realize she was so far away. Shelly immediatly dialed someone who was at the game and within minutes she was on the phone with one of the coaches and then with Austin. I’m glad she got to talk to him before he was taken to the hospital. The diagnosis was not good. Austin had dislocated his ankle, tore ligaments in his foot and broke his fibula! My heart just sank to hear this news about Austin. Especially since I knew he was one of 12 young players selected to play on the USA Mens World University team this summer in Italy. Austin’s surgery went well and I’m happy to say he is on the road to recovery! I know when unexpected situations like this happen they can bring discouragement, so I wanted to create a card to lift Austin’s Spirit and to let him know so many were thinking of him and praying for him. Here is the card I made for Austin. I used Balmy Blue and Daffodil Delight Card Stock, to match the UCLA team colors. I used my Basket Weave dynamic textured impressions embossing folder to create a texture that resembled a net. The Family and Friends stamp set allowed me to custom design a volleyball player image. The only problem was, Austin is 6’4! and the image from this set didn’t represent his size! Martha, one of Austin’s aunties was here when I was making this card and she commented on how the shoes on the image could work as knee pads. What a great suggestion and it worked! I just stamped and fussy cut another set of legs and attached them to the original image. I did the same thing to the arms as well. You can see in this close up photo how I extended the arms and legs! I also used a little bit of Sparkle Glimmer Paper to create a cast on the left leg, the leg that I thought Austin had injured. Found out later that it was actually the right leg that he hurt!! Oops! Well, I think Austin is way cuter than the card! Would you join me in praying for Austin as he continues to recover from this injury. He is a strong and resilliant young man and I pray that his spirit will continue to be lifted by the support he has from so many who love him. Let’s believe together for a complete and full recovery so that he can be back on the court doing what he loves so much very soon! Get well soon #23! Sending you lots of love and long distance healing hugs! I find inspiration in many different places. In my last post, I shared how I was inspired by a design on a dish towel. Well, the card I want to share with you today was ALSO inspired by a dish towel. Who knew that dish towels could be so inspiring?? In the Fall, my friend Natalie gave me this adorable pineapple dish towel (pictured below). I used this towel to inspire the birthday card I created for her. I probably wouldn’t have thought to mix Coastal Cabana Card Stock with Grapefruit Grove Card Stock, but the combination really works. I love the color combinations pictured in the flowers too! They are Grapefruit Grove and Calypso Coral flowers with Garden Green leaves. The flower and leaf images come from the Bloom By Bloom Stamp set. Instead of a pineapple center, I stamped a bold sentiment from the Life Is Grand stamp set. Do you see how I outlined the sentiment with a Pineapple Punch Stampin’ Blends Marker? That brought in the yellow color. I also used a bunch of the yellow Gingham Gala Adhesive Backed Sequins and put them all over the front of the card to add texture and sparkle. I hope that when Natalie opened her card she liked it as much as she did the boba tea I introduced her to at Teapresso, Kapolei. Teapresso Kapolei after a fun beach day! I liked this card so much that I decided to make it a part of my monthly Stamp A Stack class. In order to make it work for the large number of guests who attend my class, I had to alter it. I didn’t use the sequins and instead of designer paper, I textured the Grapefruit Grove card stock with the Simple Stripes textured impressions embossing folder. I think this simplified version of the card works. I had a lot of positive feedback from my class attendees this past weekend. On the day that I was designing these two cards in my studio, my friend Kristy was there. As Kristy saw these cards coming together she looked at me and said, “So, all I have to do is bring you a dish towel and you’ll make me a card”?? Too funny!!! I don’t think I told you that Natalie works for Stampin’ Up! and we’ve known one another for many years. She is one of the reasons I love Stampin’ Up! as much as I do. She has always been there to support and encourage me along the way. Natalie truly is an inspiration not just to me but to everyone she meets! I hope that she liked the card I sent, a card that she probably had no idea that was inspired by something she gave to me! So, the next time you are struggling to come up with a card design, remember that there is inspiration all around you. In your closet, in your backyard and even next to your kitchen sink! Meet my happy friend, Missy. She is a Stampin’ Up! demonstrator from New York and the head of the Glad Heart Stampers group! Missy is such a positive, happy person! Missy is one of those people who brighten a room when they enter it. This very sweet and happy friend recently celebrated her birthday. Last summer, Missy and I shared a fun adventure in Utah together. We have been friends for many years but the quality time we shared together during this trip allowed us to get to know one another even better. After finishing our work with Stampin’ Up!, we spent time hiking in a couple beautiful places. One of the highlights of our time together was a day spent with Donna Griffith. We visited her beautiful home, saw her stamp studio, and then headed to her cabin for an afternoon of fun and adventure. Donna and her husband Jeff are such a lovely couple and were truly amazing hosts. We had such a wonderful time with them both. While at the cabin we saw so many beautiful creatures like moose, rabbits and deer. I also spotted several squirrels. Missy thought it was funny that I was excited to see a squirrel! I explained to her that we don’t have squirrels in Hawaii. Missy told me that at her home there are tons of squirrels and they make a big mess! Needless to say, she is not as big of a fan of these furry creatures as I am. A couple months ago, Missy mailed me a package and inside was this cute squirrel dish towel. Now, I could see a squirrel anytime I went into my kitchen!!! I used Missy’s thoughtful gift to inspire the birthday card I created for her. Missy’s Card was created with the set Fable Friends. I used Real Red Card Stock as the base of the card since it matched the red on the squirrels scarf. I absolutely love the sentiment on this card! It comes from the stamp set Life Is Grand. I used a Gold Faceted Gem to place in the center of the daisy flower. It added a little bit of texture and sparkle to Missy’s card. I used other images from the Life is Grand stamp set on the inside of the card. There was also a pocket in this card where there was room to place a gift card. 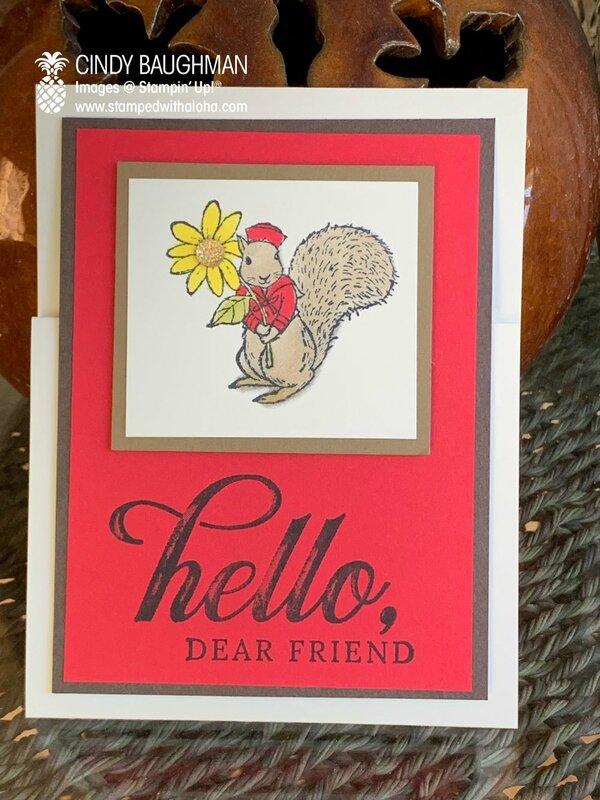 After receiving her card, Missy texted me and said, “Happiness is a smiling squirrel and a delightful birthday card!” I’m glad receiving this card made my happy friend even happier! !